Note: The following is a press release issued by the Arcata Community Recycling Center. It has been edited only for punctuation. – Ed. HUMBOLDT – The Arcata Community Recycling Center’s (ACRC) Board of Directors has voted to cease all operations by Jan. 14, 2012. Facility closures include Arcata Community Recycling Center’s Reusables Depot located at 1380 Ninth St. in Arcata; the Center for Hard to Recycle Materials (CHaRM) located at 1445 10th St. in Arcata; and the organization’s Processing Facility located at 555 Vance Ave. in Samoa. Additionally, ACRC’s Commercial collection program servicing 200 area businesses and ACRC’s Education Program that presented educational programs to over 4,000 students and residents annually will come to an end. All 35 employees of the organization will be laid off. The ACRC Board thanks the residents of Humboldt County for their 40 years of support. The organization was an outgrowth of the first Earth Day in 1970 and formed in 1971 to promote economically beneficial alternatives to disposal of materials that could be recycled. 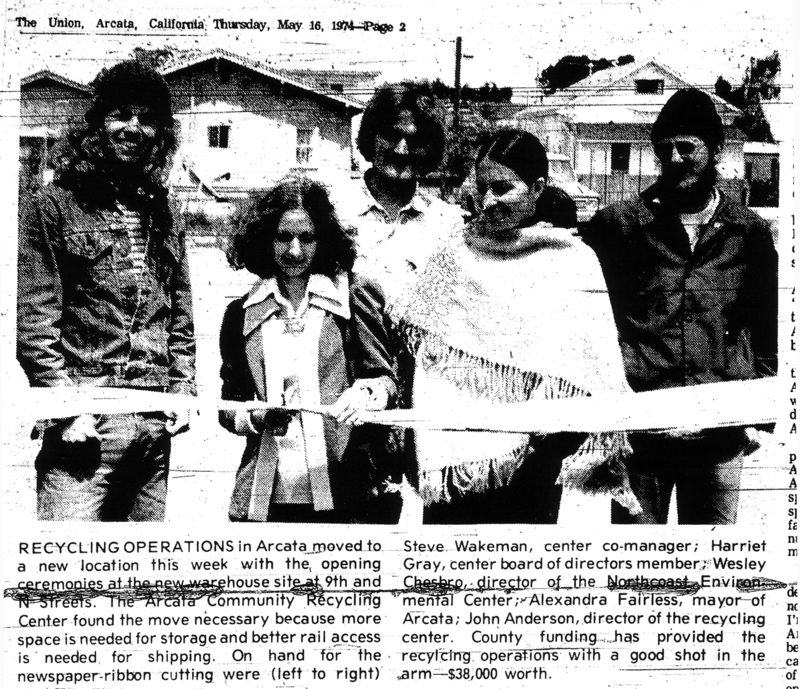 In the four decades that have followed, ACRC has been an international model for community-driven waste diversion efforts. Legislative support for these efforts was not apparent until 1989 when the State of California mandated that municipalities divert at least 50 percent of waste generated from landfills. Recently that mandate was increased to 75 percent. The HWMA issued a Request-for-Proposals (RFP) for processing of recyclables handled by ACRC. This occurred following two failed votes to acquire ACRC facilities. ACRC had resisted the attempted acquisition. The diversion of recyclables from ACRC’s processing system by HWMA leaves the organization unable to continue to financially support the organization’s activities. The ACRC Board of Directors continues to encourage residents to be involved in their municipality’s discussions on the handling of recyclables. Recyclables are the one part of the waste stream that generates revenues and this is money that can support local jobs and help reduce overall garbage service costs. Exporting the material, as is now being done, results in loss of local jobs and hurts the Humboldt County economy. The HWMA will receive approximately $50,000 per year for the recyclables currently shipped out of Humboldt County. The county’s economy will lose $1.5 million dollars in annual payrolls and experience an additional $2.5 million loss in economic activity involving many local businesses in exchange. All ACRC facilities will operate normally through the end of this year. Arcata drop-off, buy-back, and Thrift Store are open Tuesday through Saturday, 10 a.m. to 5:30 p.m. ACRC’s Samoa facility will accept materials from curbside programs, Humboldt State University and trade accounts through early January 2012. For questions about recycling please call (707) 445-4321 or visit arcatarecycling.org. This entry was posted on Tuesday, November 1st, 2011 at 2:05 pm	and is filed under News, Environment. You can follow any responses to this entry through the RSS 2.0 feed.